Susan in Balbriggan, Co. Dublin commissioned this gift of the Hall & Falvey coat of arms to mark the Pearl Anniversary of her parents marriage. 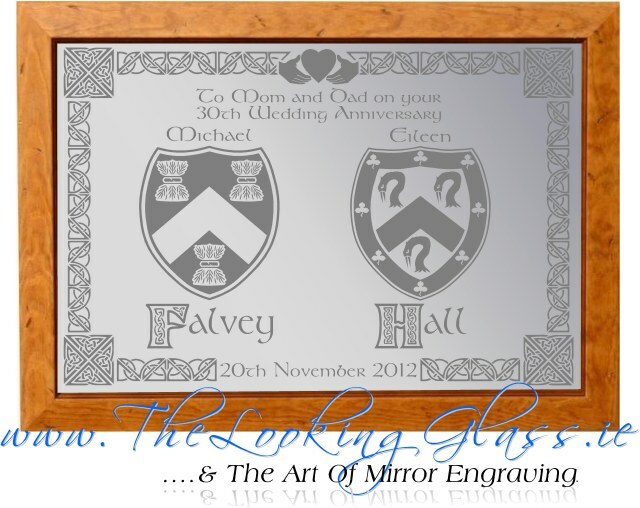 As we are always delighted to do, we altered the design of this engraved mirror gift to add in a personalised message from Susan which read “To Mom and Dad on your 30th Wedding Anniversary”. It’s always lovely to hear how our creations are received, and Susan took the time to email us…. You were great to have my order made so quickly. It was just perfect, my Mam and Dad loved it!